Oh, my sweet Z...have to gush about him today. Ok so we are at the playground and there is this kid who isn't playing with anyone else, he's around Logan's age. Logan was in school so I assumed this kid was home schooled. Zane goes over to this kid and the kid doesn't stop playing...doesn't even notice Z is there. Then my autistic radar goes off and I watch Z interact with this boy. He (the boy) is in "his zone"...Logan use to get like this a lot...not so much during the school year but it did reappear during the summer. He will be so into what he is playing with that the house could be on fire and he wouldn't notice. The only way to get him out, of this zone, is to mirror him. To grab a guy (for example if that is what he's playing with) and totally do exactly what he is doing with the toy, right next to him...and for some reason that's how you get autistic kids out of it and willing and able to engage in play with you. So I watch Zane doing exactly that with this little boy. And finally the boy looks up at him and Zane immediately starts talking to him. The little boy is doing echolia which is repeating either the same word or phrase over and over again. Something we have seen in our house many, many times. Well Zane goes right there with this kid. And because my kids are pixar junkies Zane knew right away what movie he was reciting and delivered the next line in the movie. Instantly they were friends, they go running off and take turns trying to climb up the slide. I look over at the other mom and she has tears running down her face with the biggest smile. I go over to her and ask how old her son is....making small talk...and she can't peel her eyes away from Zane and her son....and finally she says "he's never played with another child like this ever!" 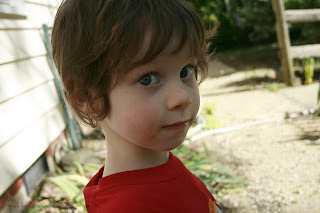 I smiled and replied, "My oldest son is autistic." She looks at me and says "so is he, but he's never played like this before." I couldn't stop smiling either. I was so proud of Zane for bridging that gap. For being the child who plays with the autistic child at the playground, not because he was told to but because he found comfort in this boy. And at 3 to show the type of advocate for his brother that he will be. It's natural..it's what he knows. And I am just so happy that I got to see it with my own eyes. Zane will keep building those bridges. He is really one of a kind. Zane needs a real big hug. That story made me cry too. You are raising two wonderful boys. Children learn by example. Zane has seen this in his past and knew how to handle the situation. What a sweetheart!! You are raising one sensitive little guy!! Man, I wish I had read this before seeing you today-- I think I would have uncontrollably hugged your darling child! (And now I feel even worse about my lack-of-self-control-2-year-old-daughter being all mean to him!!) This was a beautiful and moving post. Sure puts life into perspective. That's beautiful. And you can share the credit. You and Jon are amazing. Thank you for sharing. Squeezes to both boys. You're obviously doing a fantastic job, Gretchen. Your sons will be able to teach people so much just by being who they are. simply amazing - i never under estimate the power of a child! So beautiful, thank you for sharing! This post was so lovely. Yayyy, Zane! Having a little brother who sees you as if this is how you are meant to be yet also brings out the best in you is priceless. It is a perfect therapy in itself. One day I tried to explain to my littlest why his brother goes to speech therapy. He looked at me as though my explanation made no sense and was not needed. I stopped myself realizing that he does not expect anything different of his brother than to be who he is!